N-[2-[2,3,7,8-tetrahydro-1H-furo(2,3-g)indol-1-yl]ethyl]acetamide (GR196429) is a novel, nonindolic melatonin receptor agonist. GR196429 had high affinity for human mt1 (pKi 9.9) and MT2 (pKi 9.8) receptors expressed in Chinese hamster ovary cells and for 2-[125I]-iodomelatonin binding sites in human cerebellum, guinea pig superior colliculus and hypothalamus and chicken retina and tectum (pKi 8.8–9.5). GR196429 was inactive at a wide range of other hormone and neurotransmitter receptors. In Chinese hamster ovary cells expressing human mt1 or MT2 receptors, both melatonin and GR196429 dose-dependently inhibited forskolin-stimulated cAMP accumulation. 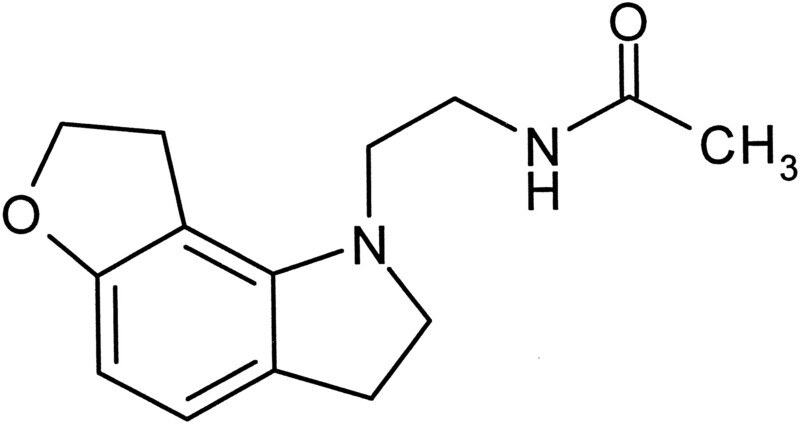 In rabbit isolated retina, GR196429 inhibited calcium-dependent [3H]-dopamine release with potency (IC50 30 pM) and maximum effect (76 ± 5% at 1 nM) similar to those of melatonin. The response was antagonized by the melatonin receptor antagonist luzindole (1 μM). In slices of rat brain suprachiasmatic nucleus, perfusion (1 h) with GR196429 at zeitgeber time 10 phase advanced the circadian peak in neuronal activity measured on the following day, with a maximum phase advance of 2.7 ± 0.3 h at 10 pM and an EC50 of 0.6 pM, results that indicated a melatonin-like action on the phase of the circadian clock. CNS penetration and duration of receptor occupancy was determined in anex vivo radioligand binding assay. In membranes of guinea pig superior colliculus prepared 30 min after administration of GR196429 (s.c.), 2-[125I]-iodomelatonin binding was inhibited with an ED50 of 0.04 mg/kg. After a dose of 1 mg/kg, binding was significantly inhibited for at least 3 h. Thus GR196429 is a potent and selective agonist at high-affinity melatonin receptors, which modulates circadian rhythms in an in vitromodel of the circadian clock and which readily penetrates the CNS. The indole-based hormone melatonin is secreted from the pineal gland and has a wide variety of biological actions. Of particular interest are its putative role as an internal Zeitgeber (time giver) for the circadian clock in the SCN of the brain and its neuroendocrine effects, such as regulation of reproductive function in seasonal breeding mammals (for review, see Arendt, 1995). Melatonin is known to exert some of its effects through specific membrane-bound G protein-coupled receptors, which can be labeled with high picomolar affinity by the radioligand 2-[125I]-iodomelatonin in several tissues, including rat and human SCN, sheep pars tuberalis and chicken retina (for review, see Morgan et al., 1994). Ligands compete for 2-[125I]-iodomelatonin binding to native high-affinity melatonin receptors with the rank order of potency 2-iodomelatonin ≥ melatonin ≫ N-acetylserotonin ≥ prazosin > 5-HT. Affinity at these sites has been correlated with functional responses to melatonin in tissues such as the rabbit retina (inhibition of evoked [3H]-dopamine overflow) andXenopus isolated melanophores (pigment aggregation) (for review, see Dubocovich, 1995). Three different cDNAs encoding putative 7-transmembrane domain high-affinity melatonin receptors have been cloned (for review, see Reppert et al., 1996). To date, only two of these have been found in mammalian tissues. In situhybridization studies have shown the presence of mRNA for the mt1 receptor in human fetal and rat SCN and the hypophyseal pars tuberalis of sheep (Reppert et al., 1994; Weaver and Reppert, 1996), a result that may implicate the receptor in the circadian and reproductive effects of melatonin. The second G protein-coupled melatonin receptor, MT2, was cloned from the human genomic library and is expressed in retina and brain (Reppertet al., 1995). The functional significance of this subtype is at present unclear. However, in the mammalian retina, activation of a melatonin receptor with the pharmacological characteristics of the human MT2 subtype modulates the calcium-dependent release of dopamine (Dubocovich, 1995; Dubocovich et al., 1997). As a pharmacological tool and therapeutic entity, melatonin is limited by its rapid metabolic degradation in vivo and its poor aqueous solubility. In an attempt to develop new chemical tools to probe the function of the high-affinity melatonin receptor in vitro and in vivo, we investigated the activities of a series of tricyclic indolines that were designed to mimic the agonist actions of melatonin at high-affinity melatonin receptors and have the potential for improved resistance to metabolic breakdown viaO-demethylation. The in vitro pharmacology of one such compound, GR196429 (fig. 1), is described here and compared with known indolic melatonin receptor ligands and with S-20098, a naphthalenic compound that is a potent melatonin receptor agonist (Yous et al., 1992). To help define the in vivo potency and duration of action of the compound at high-affinity melatonin receptors in the CNS, we have developed and validated an ex vivo receptor occupancy assay (Beresford et al., 1994, 1995). This is a high-affinity melatonin receptor radioligand binding assay that uses brain tissue taken from guinea pigs previously treated with melatonin or its analogs. Guinea pig was chosen for convenience because it has been previously determined that, in contrast to rat brain, where high-affinity melatonin binding is restricted mainly to the SCN, this mammal has higher densities of high-affinity specific 2-[125I]-iodomelatonin binding sites in several brain areas. These include thalamic nuclei and visual integration structures such as lateral geniculate nucleus and superior colliculus (Bittmanet al., 1993; Dubocovich, M. L., unpublished observations). For in vitro radioligand binding assays, guinea pig brains (male, Dunkin Hartley, 200–220 g) were obtained from Harlan Olac (Bicester, Oxon, U.K.), and frozen human cerebellar tissue was supplied by the International Institute for the Advancement of Medicine (Scranton, PA). Human tissue was obtained 1.5 to 2 hpost mortem from brains of two adult human subjects (one male age 66 and one female age 85). Chickens (adult, white leghorn) were obtained from a Chicago supplier, C3H/HeN mice (5–6 weeks old) were obtained from Harlan (Indianapolis, IN). Rabbits (New Zealand White, 2.5–3.5 kg) were obtained from New Franken Rabbits (New Franken, WI). For ex vivo binding studies, male Dunkin Hartley guinea pigs (Interfauna, Huntingdon, Cambs, UK), 200–300 g were used. Studies were carried out during the light phase of a 12 h:12 h light:dark cycle. Rat SCN slice experiments were performed with male hooded rats (Lister Hooded Strain, Glaxo Wellcome, 150–350 g), which were housed on a 12 h:12 h light:dark cycle for a minimum of 3 weeks before the experiment (lights on at 6:00 a.m., defined as ZT 0). Generation of CHO-hmt1 and CHO-hMT2cells. Initial clones were generated by PCR on genomic DNA using oligonucleotide primers suggested by the published nucleotide sequences of the receptors (Reppert et al., 1994, 1995). Initial cloning was in pBluescript (Stratagene). The nucleotide sequences that were obtained encoded for the same amino acid sequences as described byReppert and colleagues (1994, 1995). The sequences were cloned into mammalian “all in one” expression vectors that also encode resistance to the antibiotic G418. This vector was introduced by conventional calcium phosphate precipitation techniques into CHO cells, which were then placed under G418 selection (1 mg/ml). Several G418-resistant mt1 and MT2 cell lines were selected for [3H]-melatonin saturation assays, and the cell lines that gave the highest receptor expression were chosen for further studies. Expression levels were 1.20 ± 0.10 and 0.82 ± 0.06 pmol/mg protein for mt1 and MT2 cell lines, respectively. Higher expression levels in recombinant receptor cell lines enabled us to examine recombinant melatonin receptors using [3H]-melatonin rather than 2-[125I]-iodomelatonin, which was used to study the native receptors (Browning et al., 1997). Radioligand binding studies: tissue preparation. Guinea pig superior colliculus and hypothalamus and human cerebellum were dissected, and membranes prepared, on the day of assay. Tissue was homogenized (Ultra Turrax, 2 × 4 s) in 20 vol Tris-HCl buffer and centrifuged at 48,000 × g for 15 min at 4°C. The resulting pellet was resuspended in 20 vol buffer and recentrifuged as above. The final pellet was resuspended in Tris-HCl buffer to give a final tissue concentration of 20 mg w.wt./ml. Chicken tissue synaptosomal membranes were prepared as previously described (Dubocovich and Takahashi, 1987). Membrane pellets were resuspended in Tris-HCl buffer to yield a protein concentration of 0.15 to 0.2 mg/ml. CHO cells stably expressing human mt1 and MT2receptors were harvested using Hanks’ balanced salt solution containing EDTA (5 mM) and centrifuged at 4500 × g for 35 min. The pellet was resuspended in Tris-HCl buffer, and aliquots (27 cells per ml) were stored at −80°C until use. On the day of assay, membranes were resuspended in Tris-HCl buffer at a concentration of 62.5 μg protein/ml. Protein estimation was performed using the Bio-Rad-coomassie blue method with bovine serum albumin as standard (Bradford, 1976). For [3H]-melatonin experiments, drug and [3H]-melatonin (0.3 nM) were incubated with membranes (400 μl) for 120 min at 37°C. Nonspecific binding was defined by melatonin (1 μM). Bound radioactivity was separated by rapid filtration using a Brandel cell harvester through GF/B filters (previously soaked in 0.1% polyethylenimine), which were washed (6 × 1 ml) with ice-cold Tris-HCl buffer. Filters were counted by liquid scintillation spectrometry. 2-[125I]-Iodomelatonin experiments in guinea pig and human tissues were carried out as for [3H]-melatonin experiments in CHO membranes, using 2-[125I]-iodomelatonin (50 pM). 2-[125I]-Iodomelatonin experiments in tissues from chicken were performed as described by Dubocovich and Takahashi (1987). Binding reactions were incubated at 25°C for 60 min. The receptor binding profile of GR196429 was determined using Battelle’s Receptogram screen (Geneva, Switzerland). Measurement of inhibition of forskolin-induced cAMP production. The assay was performed in 96-well plates in a final assay volume of 200 μl. Confluent CHO-mt1 or CHO-MT2 cells were incubated at 37°C in DMEM-F12 medium containing 300 μM IBMX. After a 60-min incubation, GR196429 or melatonin (1 pM–1 μM) was added. Sixty minutes later, forskolin (30 μM) was added, and cells were incubated for a further 15 min. The reaction was terminated by removal of media and addition of ice-cold ethanol (100 μl) for 30 min at 4°C. Samples were evaporated to dryness, and cAMP concentrations were determined by scintillation proximity assay (Amersham) (Amersham, UK). [3H]-Dopamine release from rabbit retina. Experiments were conducted as previously described (Dubocovich, 1985;Dubocovich and Takahashi, 1987). Briefly, rabbit retinas were incubated for 20 min at 37°C with [3H]-dopamine (0.1 μM), placed in superfusion chambers and superfused with Krebs solution (1 ml/min; 37°C) containing (S-R)-sulpiride (0.1 μM), to block D2 dopamine autoreceptors. Superfusate fractions were collected every 4 min. Two periods of field stimulation (2 min, 3 Hz, 20 mA, 2 ms) were applied 60 (S1) and 100 (S2) min after the end of incubation with [3H]-dopamine. Drugs were added to the perfusion medium 40 and 20 min before S1and S2, respectively, and were present for the remainder of the experiment. At the end of the experiment, retinal tissue was solubilized, and tritium content was determined by liquid scintillation spectrometry. GR196429, melatonin, S-20098, 2-iodomelatonin, 6-hydroxymelatonin, N-acteylserotonin or vehicle (saline) was administered s.c. to guinea pigs. After different pretreatment times (15–240 min), animals were anesthetised with a lethal dose of pentobarbitone (200 mg/kg i.p.) and transcardially perfused (60 ml) with ice-cold Tris-HCl buffer. The superior colliculus was removed and stored at −20°C until use. A minimum of three animals were used for each data-point. On the day of assay, samples were homogenized in ice-cold Tris-HCl buffer (25 mg w.wt./ml), and the 2-[125I]-iodomelatonin radioligand binding assay was performed as described above. Studies were performed as previously described (Starkey et al., 1995). Rats were decapitated in their light phase between ZT 5:00 and 8:00, and a coronal brain slice (500 μm) containing the SCN was cut on a vibratome. Slices were submerged in and perfused by artificial cerebrospinal fluid (ACSF; 37°C; 1.2 ml/min). Vehicle (water) or GR196429 was added to the ACSF on day 1 from ZT 9.5 to 10.5. On day 2, single unit electrical recordings of spontaneously active SCN neurons were carried out using carbon fiber microelectrodes. The firing rates of single neurons were sampled randomly throughout all regions of both SCN at approximately 1 neuron every 5 min. GR196429 and the naphthalenic melatonin agonist S20098 (Yous et al., 1992) were synthesized by Medicinal Chemistry, Glaxo Wellcome. Melatonin, 6-hydroxymelatonin and N-acetylserotonin were supplied by Sigma (Poole, Dorset, UK). 2-Iodomelatonin was purchased from RBI (Natick, MA). GR196429 was supplied as a hydrochloride salt. Using standard techniques, the hydrochloride salt of GR196429 is soluble in water to excess of 40 mg/ml (compared with less than 1 mg/ml for melatonin and the other melatonin analogs used, which do not form salts). Doses of GR196429 refer to the weight of the free base. 2-[125I]-Iodomelatonin (specific activity 2000 Ci/mmol), [3H]-melatonin (85 Ci/mmol) and [3H]-dopamine (55 Ci/mmol) were supplied by Amersham (Amersham, UK). The composition of Tris-HCl buffer for radioligand binding studies was Tris-HCl (50 mM) containing 2 mM MgCl2, 1 mM EDTA, 0.1% ascorbic acid, pH 7.4. The composition of ACSF for rat SCN slice preparations was (mM): NaCl (116), KCl (5.4), NaHCO3(26.2), MgSO4 (1), NaH2PO4 (0.99),d-(+)-glucose (24.6), CaCl2 (1), pH 7.4. The antibiotic gentamicin (0.005% solution) was added to the ACSF, which was sterilized by filtration (pores 0.2 μm in diameter). The ACSF in which the slices were cut contained HEPES (10 mM). ACSF was saturated with 95% O2 and 5% CO2. The composition of Krebs for rabbit retina experiments was (mM): NaCl (108), KCl (4.7), NaHCO3 (25), NaH2PO4 (1),d-(+)-glucose (11.1), CaCl2 (1.3), MgCl2 (1.2), ascorbic acid (0.11), EDTA (0.004). Radioligand binding competition curves were analyzed using iterative curve-fitting techniques (ALLFIT, DeLeanet al., 1977; Michel and Whiting, 1984; or INPLOT (Graph Pad, San Diego, CA)) to determine IC50 values, followed by subsequent conversion to Ki values using the Cheng-Prusoff equation (Cheng and Prusoff, 1973). Results are expressed as mean ± S.E.M. For functional experiments in CHO cells (forskolin-induced cAMP accumulation), data were fitted to a four-parameter logistic model (ALLFIT, DeLean et al., 1977) to determine IC50values (mean and 95% confidence limits). The equipotent molar ratio was defined as the IC50 of GR196429 expressed as a ratio of the IC50 of melatonin, determined in the same experiment. For rabbit retina experiments, the fractional rate of [3H]-dopamine release in each fraction was calculated by dividing the tritium released during that fraction by the total radioactivity present in the tissue at the start of each fraction. Drug effects on stimulated [3H]-dopamine release were expressed as the ratio of fractional rate of release above basal (spontaneous) evoked by S2 to that evoked by S1—that is, S2/S1. Drug effects on spontaneous efflux were expressed as the ratio (Sp2/Sp1) of fractional rate of release in the fractions immediately before each period of stimulation (Dubocovich, 1988). For ex vivo binding experiments, mean specific 2-[125I]-iodomelatonin binding was determined in at least three vehicle-treated animals in each experiment. 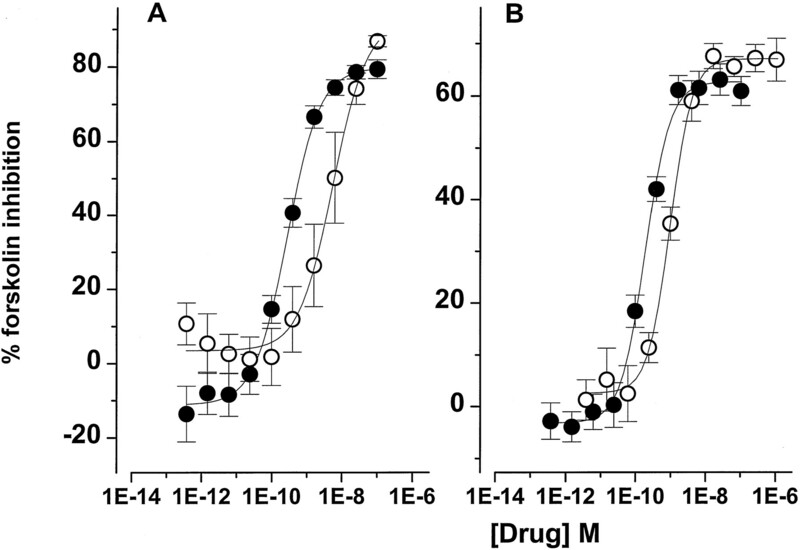 Specific 2-[125I]-iodomelatonin binding in each drug-treated tissue sample was measured and expressed as percent inhibition of specific binding compared with vehicle-treated animals. ED50 values were calculated from mean percent inhibition values at each data-point, using ALLFIT (De Lean et al., 1977). Half-lives were determined by linear regression analysis. For the rat SCN slice preparation, firing rates from single SCN neurons measured throughout the experiment were averaged into 1-h running means calculated every 0.5 h. The time of the peak in firing rate was taken as the time of the highest 1-h mean, which gave an accuracy to the nearest 0.5 h. When data from several slices were pooled, points were the mean ± S.E.M. of the 1-h means from each slice. Because the neuronal firing rate from control slices peaked at ZT 7.0 ± 0.2 h, all phase advances were calculated with respect to ZT 7. Phase shifts for pooled data are expressed as mean ± S.E.M. Statistical analysis to test for significance of the effects of GR196429 treatment on the time or height of the peak in firing rate were performed using one-way ANOVA followed by Dunnett’s test. The EC50 for GR196429 was calculated using ALLFIT (De Leanet al., 1977); n values refer to the number of slices, each one from a different animal. GR196429 potently competed for 2-[125I]-iodomelatonin binding to native high-affinity melatonin receptors in human cerebellum, guinea pig superior colliculus and hypothalamus and chicken retina and tectum with similar nanomolar affinities (tables 1 and2; fig. 2). The compound bound with similar nanomolar affinities to [3H]-melatonin-labeled human recombinant mt1and MT2 receptors expressed in CHO cells (table 1). Comparative data for the ability of melatonin and other melatonin analogs to compete for radiolabeled melatonin binding to these tissues are given in tables 1 and 2 and, for human cerebellum, in figure 2. No Hill slopes were significantly different from unity, with the exception of 2-iodomelatonin at mt1 receptors (1.38 ± 0.09, P < .05). Competition for specific binding of 2-[125I]-iodomelatonin to human cerebellar membranes by 2-iodomelatonin (▾), S20098 (•), melatonin (□), GR196429 (▪), 6-hydroxymelatonin (○), 6-chloromelatonin (▴), luzindole (⧫) and N-acetylserotonin (◊). Data shown are for representative experiments with each point determined in duplicate. Results are expressed as percentage specific binding. Nonspecific binding was defined using 1 μM melatonin. Selectivity of GR196429 for high-affinity melatonin receptors over a large number of other hormone or neurotransmitter receptors was investigated using a commercially available screen of radioligand binding assays (Batelle, Geneva, Switzerland). GR196429 displayed little or no affinity for adenosine A1 and A2; adrenergic alpha-1,alpha-2 and beta-2; dopamine D1 and D2; GABAA and GABAB; 5-HT1A, 5-HT1C, 5-HT1D, 5-HT2 and 5-HT3; muscarinic M1, M2 and M3; nicotinic; histamine H1, H2 and H3; NMDA; angiotensin AT1and AT2; bradykinin; CCKA and CCKB; CGRP; endothelin; tachykinin NK1, NK2 and NK3; opiate μ, γ and κ; somatostatin; strychnine-insensitive glycine receptors and K channels (ATP-sensitive and -insensitive). All IC50 values were greater than 10 μM, except M1, H2 and H3, which were greater than 1 μM. GR196429 was weakly active at adrenergicbeta-1 receptors (IC50 = 7.8 μM). Further details of these studies are available on request from the corresponding author. Functional studies in CHO cells expressing human melatonin receptors. GR196429 and melatonin dose-dependently inhibited forskolin-induced cAMP accumulation in the medium of CHO cells expressing human mt1 or MT2 receptors, with a maximum inhibition similar for both compounds (fig.3). For melatonin, the mean IC50 values (with 95% confidence limits) were 0.30 (0.06–1.2) nM (n = 8) and 0.19 (0.07–0.49) nM (n = 5) in cells expressing mt1 receptors and MT2 receptors, respectively, whereas the corresponding figures for GR196429 were 9.45 (2.8–38) nM (n = 8) and 0.98 (0.26–3.6) nM (n = 5). Thus melatonin was 31 (mt1) and 4.4 (MT2) times more potent than GR196429 in these recombinant systems. Inhibition by GR196429 and melatonin of cAMP efflux stimulated by forskolin (30 μM) in CHO cells expressing human mt1 (panel A) or MT2 (panel B) receptors. Results are expressed as mean (± S.E.M.) percent inhibition of forskolin-induced stimulation against log10 concentration of melatonin (•, n = 8) or GR196429 (○,n = 5). Functional studies in rabbit retina. The spontaneous overflow of tritium in the fraction preceding the first period of stimulation (Sp1) was 0.62 ± 0.03% of the content of tissue tritium, and the ratio Sp2/Sp1 was 0.77 ± 0.03 (n = 4). GR196429 (10 nM) had no significant effect on spontaneous overflow of radioactivity (Sp2/Sp1 = 0.79 ± 0.04; n= 3). Electrical stimulation elicited a calcium-dependent S1 efflux of 1.78 ± 0.24% of total [3H]-dopamine content (n = 4). 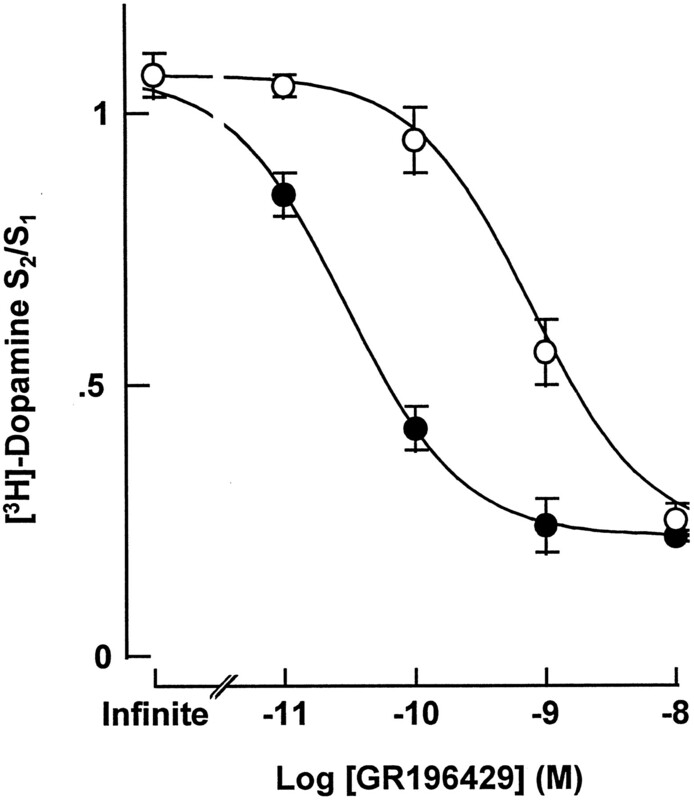 GR196429 (10 pM–10 nM) inhibited calcium-dependent release of [3H]-dopamine during S2 in a concentration-dependent manner, with an IC50 of 30 pM and a maximum inhibitory effect of 76 ± 5% (n = 4; fig. 4). This effect was antagonized by the melatonin receptor antagonist luzindole (1 μM), with a calculated affinity constant (pKB ) of 7.4. GR196429 inhibition of calcium-dependent release of [3H]-dopamine in isolated rabbit retina. Two periods of field stimulation (S2 and S1) were applied per experiment. Data is expressed as the S2/S1ratio. GR196429 (10 pM–10 nM) was added to the medium 20 min before S2, in the absence (•) or presence (○) of luzindole (1 μM). Luzindole was present in the superfusion medium from 40 min before S1 for the remainder of the experiment. GR196429 (0.1 mg/kg s.c.) maximally inhibited specific 2-[125I]-iodomelatonin binding to guinea pig superior colliculus membranes 30 min after drug administration (fig. 5A). After a 30-min pretreatment (s.c.), GR196429 competed for 2-[125I]-iodomelatonin binding in a dose-related manner (ED50 = 0.04 mg/kg (fig. 5B; table3). 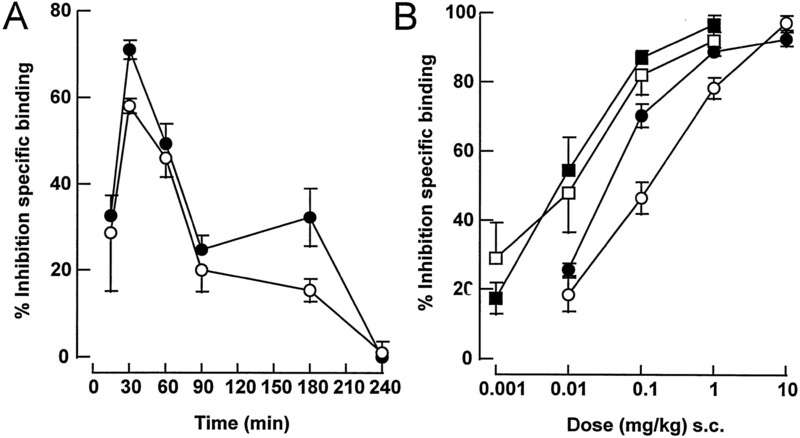 Inhibition of binding progressively decreased up to 240 min after dosing (fig. 5A), with an apparent half-life of receptor occupancy in vivo of 42 min. In comparison, melatonin had an ex vivo ED50 of 0.11 mg/kg (s.c.) and a half-life of 41 min (fig. 5, A and B; table 3). Comparative data for ex vivo potencies of other melatonin analogs are given in table 3 and figure 5B. A) Time course for ex vivo inhibition of 2-[125I]-iodomelatonin binding to guinea pig superior colliculus membranes after administration (0.1 mg/kg s.c.) of GR196429 (•) or melatonin (○). 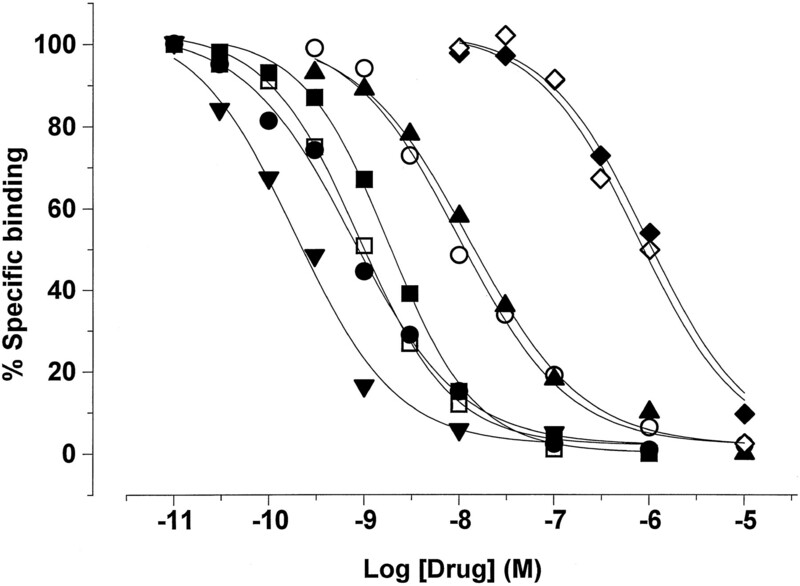 B) Dose-response curves for ex vivo inhibition of 2-[125I]-iodomelatonin binding to guinea pig superior colliculus membranes 30 min after s.c. administration of S20098 (□), 2-iodomelatonin (▪), GR196429 (•) or melatonin (○). Data are expressed as mean (± S.E.M.) percent inhibition of specific 2-[125I]-iodomelatonin binding compared with vehicle-treated control animals. n = 3–10 animals per data-point. Electrophysiological studies in rat SCN. In control slices, a mean peak of neuronal firing rate was detected in the rat SCN at ZT 7.0 ± 0.2 h (n = 4 slices; fig.6A). When GR196429 (10 nM) was perfused over the slice from ZT 9.5 to ZT 10.5 on day 1, a mean peak in firing rate was detected in the slice at ZT 4.3 ± 0.3 on day 2 (phase advance of 2.7 ± 0.3 h; n = 3 slices; P < .05 vs controls; fig. 6B). This effect was related to the concentration of GR196429 (fig. 7), with a maximum effect at 10 pM GR196429 (2.5 and 3.0 h phase advance;n = 2 slices). Curve fitting (ALLFIT, n= 15 slices) produced an EC50 of 0.60 pM and a slope of 0.97. GR196429 had no significant effect on the magnitude of the peaks in mean firing rate (Hz; P > .5). Vehicle alone (n = 2 slices, peaks at ZT 7.0 and ZT 6.5) had no effect on the time of peak. In comparison, melatonin evoked a maximum phase advance of 3 h, with an EC50 of 1.20 pM (Starkeyet al., 1995). Effect of GR196429 on the rhythm of neuronal firing rate in the rat SCN slice. A) Control slices (n = 4). B) GR196429-treated slices (10 nM, n = 3). Points are mean ± S.E.M. (1 h time bins). Hatched bar in panel B illustrates the time (ZT 9.5–10.5) for which GR196429 was perfused over the slice. The dark horizontal bar illustrates subjective night (ZT 12–0). The arrow illustrates the approximate time of slice preparation on day 1. The vertical line illustrates the calculated mean peak of firing rate determined from individual control slices. 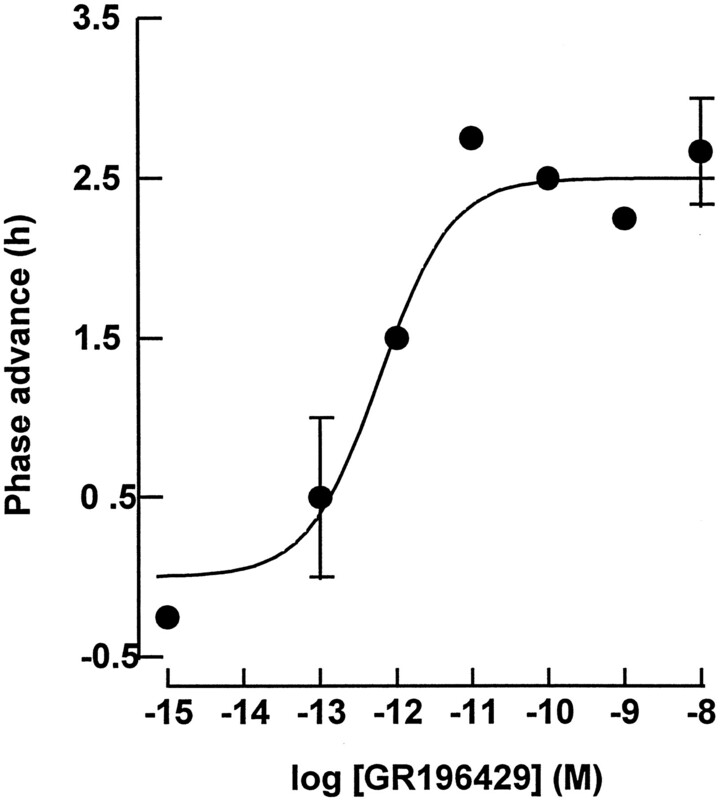 Concentration-response curve for the ability of GR196429 to phase-advance the peak in neuronal firing rate in the rat SCN slice. GR196429 was applied for 1 h between ZT 9.5 and ZT 10.5 on day 1, and shifts in activity were measured on day 2. Points are either mean ± S.E.M. (n = 3 slices) or mean (n = 2 slices). Each concentration of GR196429 was tested in separate experiments. We report the characterization of a novel, nonindolic, water-soluble, high-affinity melatonin receptor agonist, GR196429. GR196429 competed for specific 2-[125I]-iodomelatonin binding sites in guinea pig, chicken and human tissues with similar nanomolar affinities and slopes not significantly different from unity. It competed with similar affinities for [3H]-melatonin binding to human recombinant mt1 and MT2receptors expressed in CHO cells. Thus, in terms of high-affinity melatonin receptor subtype specificity, it seems that like melatonin, GR196429 is nonselective between the two mammalian receptors. GR196429 is very selective for high-affinity melatonin receptors, with little or no affinity at 40 other receptors. A third type of melatonin receptor, termed MT3, has been inferred from radioligand binding studies with 2-[125I]-iodomelatonin in hamster tissues, which have lower affinity for melatonin and a pharmacology clearly different from that of the mt1 and MT2 receptor subtypes (Duncan et al., 1989; Dubocovich, 1995). No cDNA encoding a receptor with MT3-like pharmacology has been cloned, and no clear function of melatonin binding at this site has been determined, so its status as a melatonin receptor is currently unclear. Melatonin has approximately 6-fold higher affinity than GR196429 for this site (M.L. Dubocovich, unpublished observations). Melatonin analogs competed for [3H]-melatonin binding to recombinant mt1 and MT2 receptors expressed in CHO cells with similar affinities and rank orders of potencies identical to those reported by Dubocovich and co-workers (1997) for competition of 2-[125I]-iodomelatonin binding to recombinant mt1 and MT2 receptors expressed in COS-7 cells. These data indicate that [3H]-melatonin and 2-[125I]-iodomelatonin bind to recombinant receptors with similar pharmacologies, which permits valid comparisons to be made between 2-[125I]-iodomelatonin binding data in native tissues and [3H]-melatonin binding in recombinant cell lines. In this study, melatonin and melatonin agonists, including GR196429, competed for [3H]-melatonin binding with similar affinities for both recombinant receptor subtypes, as previously described (Dubocovich et al., 1997). In our study, the most selective agonists were 2-iodomelatonin, which had 5-fold higher affinity for mt1 receptors, and 6-chloromelatonin, which displayed 5-fold higher affinity for MT2 receptors. The analog that showed the highest selectivity for the MT2 receptor was the melatonin receptor antagonist luzindole (Dubocovich, 1988). Dubocovich and co-workers (1997) described a number of putative melatonin receptor antagonists that competed with approximately 100-fold higher affinity for 2-[125I]-iodomelatonin binding to MT2compared with mt1 recombinant human receptors, which indicated that these subtypes display distinct pharmacological profiles. We extended the characterization of 2-[125I]-iodomelatonin binding sites in human cerebellum, which were recently described by Fauteck and colleagues (1994). Melatonin and melatonin analogs, including GR196429, competed for 2-[125I]-iodomelatonin binding sites in human cerebellum with the rank order of potency 2-iodomelatonin > S20098 = melatonin > GR196429 > 6-hydroxymelatonin = 6-chloromelatonin ≫ N-acetylserotonin ≥ luzindole. This rank order is identical to that observed in CHO-mt1 cells. In particular, 6-chloromelatonin is substantially less potent than melatonin and equipotent to 6-hydroxymelatonin in both human cerebellum and CHO-mt1 cells. In contrast, in CHO-MT2cells and guinea pig tissues, 6-chloromelatonin is almost equipotent to melatonin and 10- to 30-fold more potent than 6-hydroxymelatonin. Interestingly, a similar difference was reported between COS cells expressing human and sheep melatonin mt1 receptors (Reppertet al., 1994; Dubocovich et al., 1997). GR196429 was shown to be an agonist at both high-affinity melatonin receptor subtypes. In CHO cells expressing human mt1 or MT2 receptors, it mimicked the ability of melatonin to inhibit forskolin-stimulated cAMP accumulation, both agonists producing a similar maximum inhibition. However, the relative potency of GR196429 and melatonin at mt1 receptors differed somewhat from that predicted by binding studies in the same cell line. GR196429 was approximately 30-fold weaker than melatonin at inhibiting the forskolin response in CHO cells expressing mt1 receptors (compared with 2-fold weaker in binding studies). This may reflect reduced efficiency of mt1 receptor-mediated signal transduction when these receptors are occupied by GR196429 compared with when they are occupied by melatonin. Whether this is pertinent only to this recombinant system (i.e., is cell- or clone-specific) is not clear. However, this difference was not observed for MT2receptors in CHO cells, where GR196429 was similar in potency to melatonin in both binding and functional assays. In a result consistent with this, in a putative MT2 functional receptor assay in a native tissue (Dubocovich et al., 1997), GR196429 inhibited calcium-dependent release of [3H]-dopamine from rabbit retina (Dubocovich, 1985, 1988, 1995) with potency and maximum effect similar to those of melatonin. It is important to note that the effect of GR196429 was antagonized by the melatonin receptor antagonist luzindole with affinity (pKB 7.4) similar to that previously reported for inhibition of melatonin-induced responses (pKB = 7.7; Dubocovich, 1988). The action of GR196429 is probably entirely due to activation of presynaptic MT2 melatonin heteroreceptors regulating dopamine release (see Dubocovich et al., 1997), because the effect was antagonized by luzindole and the compound has no affinity for presynaptic autoreceptors (dopamine D2) and other heteroreceptors (alpha-2 adrenergic, opiate) known to operate in this tissue. Using an ex vivo radioligand binding assay, we have demonstrated that GR196429 readily penetrated the CNS of the guinea pig (ED50 = 0.04 mg/kg s.c.). At a dose of 0.1 mg/kg s.c. GR196429, Substantial inhibition remained 3 h after drug administration (32% inhibition of specific 2-[125I]-iodomelatonin binding), and a half-life of 42 min was calculated. After s.c. administration, melatonin and a range of melatonin analogs were found to occupy high-affinity melatonin receptors within the guinea pig superior colliculus with the rank order of potency S20098 = 2-iodomelatonin > GR196429 > melatonin ≫ 6-hydroxymelatonin ≥ N-acetylserotonin. Highex vivo potencies of S20098, 2-iodomelatonin and melatonin are in agreement with their high in vitro affinities for 2-[125I]-iodomelatonin receptor binding sites (see above; for review, see Morgan et al., 1994). In a result consistent with their lower affinities at melatonin receptor binding sites, possibly coupled with poorer CNS penetration, 6-hydroxymelatonin and N-acetylserotonin were unable to inhibit 2-[125I]-iodomelatonin binding at doses up to 10 mg/kg s.c. GR196429, melatonin, S20098 and 2-iodomelatonin exhibited similar time courses and half-lives of inhibition of ex vivo2-[125I]-iodomelatonin binding, which indicates that these compounds probably have similar durations of action in vivo. We evaluated GR196429 in an in vitro model of circadian function. When applied near the end of subjective day, melatonin advances the phase of physiological outputs of the mammalian circadian clock (Armstrong, 1989). We investigated the ability of GR196429 to mimic the phase-advancing action of melatonin on the circadian clock using an in vitro electrophysiological assay to measure the phase of the circadian rhythm of electrical activity in slices of rat brain hypothalamus (McArthur et al., 1991). The rat SCN brain slice exhibits a circadian pattern of neuronal firing, which peaks at around ZT 6–7 (the middle of subjective day). When applied around ZT 10, GR196429 concentration-dependently phase-advanced the peak of cell discharge activity, producing a maximum phase advance of 2.8 h (at 10 pM) and an EC50 of 0.6 pM. This compares to an EC50 of 1.2 pM for melatonin, which was previously determined using the same experimental conditions (Starkey et al., 1995). Thus melatonin, the naphthalenic melatonin agonist S-20098 (Mason et al., 1993) and now GR196429, all of which have high affinity for melatonin receptors, have been shown to phase-advance the rat circadian clock in vitrowhen applied toward the end of subjective day. The high-affinity melatonin receptor subtype involved has not yet been elucidated. Recent gene-targeting experiments in mice have suggested that mt1receptors are not involved in the phase shift at ZT 10 (Liu et al., 1997), although they are implicated in melatonin-induced inhibition of cell firing in the SCN. Melatonin phase-advances the neuronal firing rate rhythm at two times: toward the end of subjective day (ZT 10) and at the end of subjective night (ZT 22; McArthuret al., 1991). At present, we do not know whether GR196429 also affects the clock in late subjective night. GR196429 is similar in pharmacological profile to the naphthalenic melatonin receptor agonist S20098, being active at both mt1and MT2 receptor subtypes, although GR196429 has approximately 4-fold weaker affinity than the latter at the recombinant receptors. Similarly, GR196429 was approximately 5-fold weaker in theex vivo binding model. Overall, GR196429 is somewhat closer in in vitro and in vivo potency to melatonin than is S-20098. In conclusion, the tricyclic indoline GR196429 shares many of the pharmacological properties of melatonin. Thus it is a potent and selective agonist at high-affinity melatonin receptors, which is reflected in its profile of action as a modulator of rat circadian rhythms. Accordingly, GR196429 should be useful in the further characterization of melatonin receptors and should be a suitable tool to help us understand the diverse pharmacological actions of melatonin. Send reprint requests to: Dr. Russell Hagan, Neurosciences, Glaxo Wellcome Research and Development Ltd., Glaxo Medicines Research Centre, Gunnels Wood Road, Stevenage, Hertfordshire, SG1 2NY, UK. ↵1 The nomenclature and classification of melatonin receptors used here was approved recently by the Nomenclature Committee of the International Union of Pharmacology (Dubocovich et al., 1998). The denomination “mt1” corresponds to that of the recombinant receptors previously termed Mel1A. MT2 refers to native receptors with pharmacological characteristics similar to that of the recombinant receptor mt2, previously termed Mel1B. MT3corresponds to the pharmacologically defined melatonin receptor subtype, with unknown molecular structure, previously referred to as ML2. ↵2 Present address: Department of Molecular Pharmacology and Biological Chemistry, 303 East Chicago Avenue, Chicago, IL 60611. (1995) Melatonin and the Mammalian Pineal Gland. (Chapman and Hall, London). (1989) Melatonin: The internal zeitgeber of mammals? Pineal Res Rev 7:157–202. (1995) Measurement of CNS penetration of melatonin analogues using an ex vivo radioligand binding assay. Biol Rhythm Res 26:367. (1994) Localization and characterization of 2-[125I]-iodomelatonin binding sites in guinea-pig brain. Am Soc Neurosci 20:1440. (1993) The sites and consequences of melatonin binding in mammals. Am Zool 33:200–211. (1997) Pharmacological characterization of [3H]-melatonin binding to human recombinant melatonin mt1 and MT2 receptors. Br J Pharmacol 120:361P. (1973) Relationship between the inhibition constant (Ki) and the concentration of inhibitor which causes 50 percent inhibition (I50) of an enzymatic reaction. Biochem Pharmacol 22:3099–3108. (1977) Simultaneous analysis of families of sigmoidal curves: Applications to bioassay, radio-ligand assay, and physiological dose-response curves. Am J Physiol 235:E97–E102. (1985) Characterization of a retinal melatonin receptor. J Pharmacol Exp Ther 234:395–401. (1988) Luzindole (N-0774): A novel melatonin receptor antagonist. J Pharmacol Exp Ther 246:902–910. (1995) Melatonin receptors: Are there multiple subtypes? TIPS 16:50–56. Dubocovich ML, Cardinali DP, Hagan RM, Krause DN, Sugden D, Vanhoutte PM and Yocca FD (1998) Melatonin Receptors. The IUPHAR Compendium of receptor Characterization and Classification. IUPHAR Media, London (in press)..
(1997) Melatonin receptor antagonists that differentiate between the human Mel1a and Mel1b recombinant subtypes are used to assess the pharmacological profile of the rabbit retina high-affinity melatonin presynaptic heteroreceptor. NS Arch Pharmacol 335:365–375. (1987) Use of 2-[125I]-iodomelatonin to characterise melatonin binding sites in chicken retina. Proc Natl Acad Sci 84:3916–3920. (1989) Characteristics and autoradiographical localization of 2-[125I]-iodomelatonin binding sites in Djungarian hamster brain. Endocrinology 125:1011–1018. (1994) The adult human cerebellum is a target of the neuroendocrine system involved in the circadian timing. Neurosci Lett 179:60–64. Mason R, Delagrange P and Guardiola B (1993) Melatonin and S-20098 mediated resetting of rat suprachiasmatic circadian clock in vitro. Br J Pharmacol 108(suppl):32p..
(1991) Melatonin directly resets the rat suprachiasmatic circadian clock in vitro. Brain Res 565:158–161. (1984) Analysis of ligand binding data using a microcomputer. Br J Pharmacol 83:406P. (1994) Melatonin receptors: Localization, molecular pharmacology and physiological significance. Neurochem Int 24:101–146. (1995) Molecular characterization of a second melatonin receptor expressed in human retina and brain: The Mel1b melatonin receptor. Proc Natl Acad Sci 92:8734–8738. (1996) Melatonin receptors step into the light: Cloning and classification of subtypes. TIPS 17:100–102. (1995) Modulation of the rat suprachiasmatic circadian clock by melatonin in vitro. Neuroreport 6:1947–1951. (1996) The Mel1a melatonin receptor gene is expressed in human suprachiasmatic nuclei. Neuroreport 8:109–112. (1992) Novel naphthalenic ligands with high affinity for the melatonin receptor. J Med Chem 35:1484–1486.